It's true, isn't it?? Some people in your life just make the World a Better Place!! I have many amazing people in my life that do just that! Sending a cool card to show how they 'move me' is fun when there is an interactive card that moves, has bright colors, cool textures and bling! So join me and see how fun it was to make this card.. and let me know who makes YOUR World a Better Place (leave me a comment and I will pull a winner for this card!!). I LOVE my Big Shot... sigh... the world was better when it came into my life (seriously - lol). 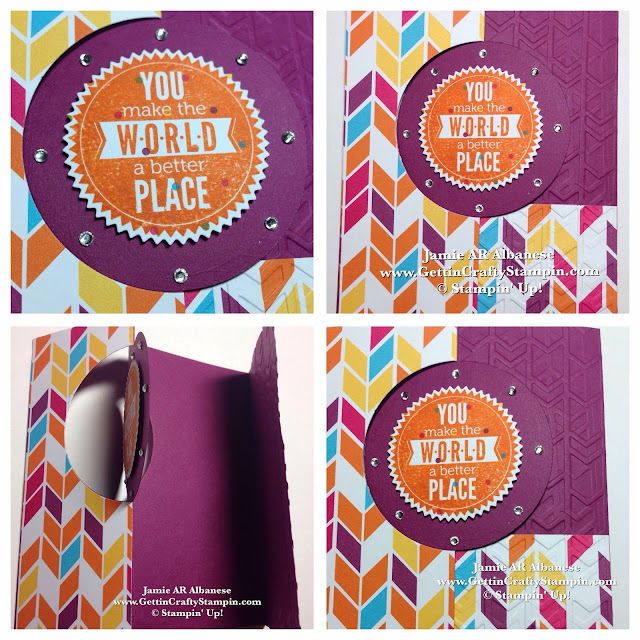 So this fun, interactive card with cool texture comes to life thanks to the aide of my beloved Big Shot! So the use of our Thinlits Cards makes for cool interactive, moving cards! 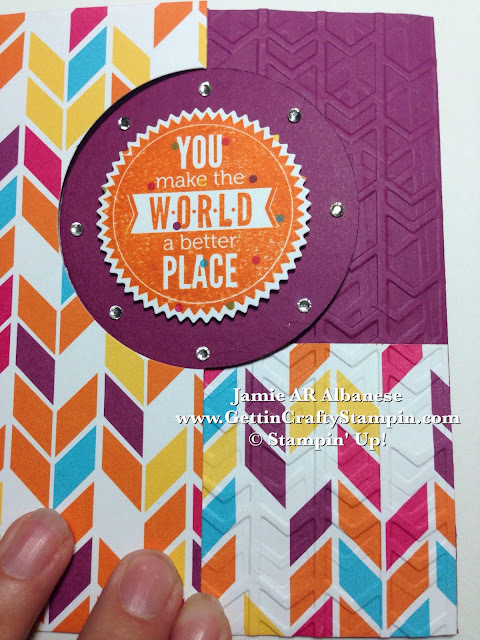 Here the Circle Card Thinlit, in Rich Razzleberry card stock, makes for a fun and colorful hand-stamped card. When using my Framelits and Thinlits, USE THE MAGNETIC Platform - lol. It is a SUPER HERO in crafting to keep the paper RIGHT where you want it! Add BLING - sparkle is easy with the adhesive backed Rhinestone Jewels. 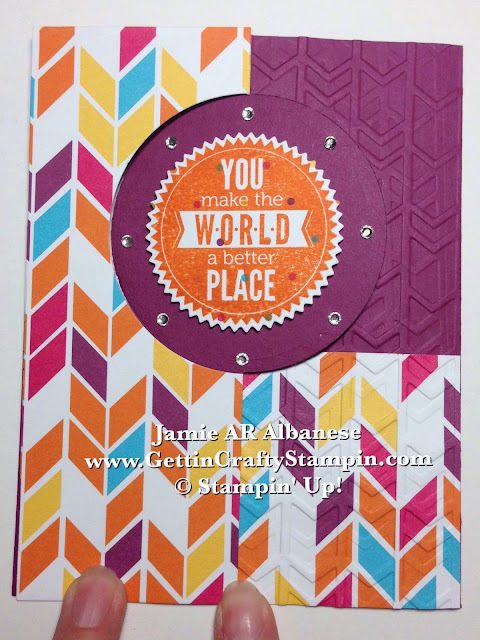 Simply apply the saying to the Circle area of the card with Stampin' Dimensionals. Apply the Rhinestone Jewels around the area for a cool and easy accent. 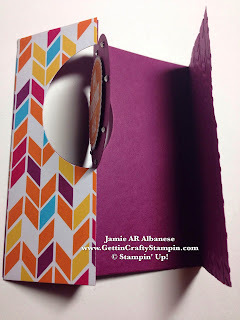 I LOVE how the Sweet Taffy Designer Series Paper is On-Trend!! Here you can see how it coordinates with the pattern and colors that Starbucks is using! Let me toast it, lol. Consider a fun Private Class (with me) and have your family and friends join you! I hope that you enjoyed this Christmas in July hand-stamped card. Don't Miss OUT on Upcoming Classes.. from the Sparkle and Shine class to Blessings Cards, Crafternoons and more! RSVP ASAP. Delivering a hand-stamped card is the perfect way to show that you care, it's just that much more special! 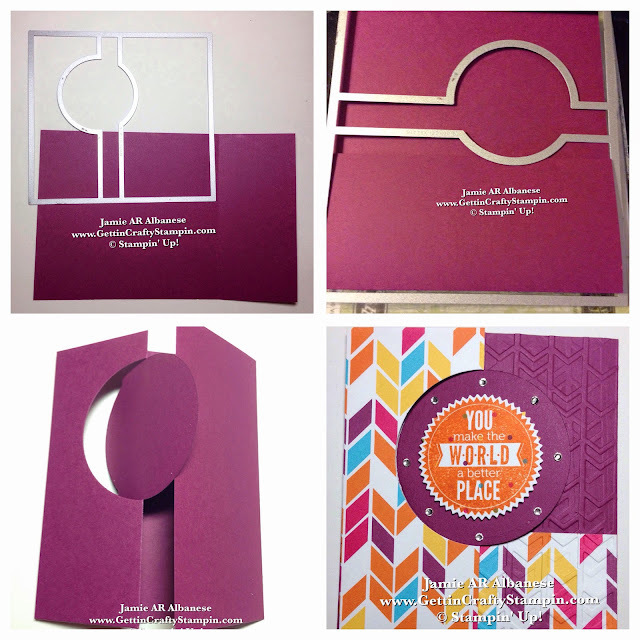 When someone adds color to your life, send them a hand-stamped, interactive/moving, embossed, bling card that will delight. This card is easier than you can imagine but delivers HUGE Wow factor! 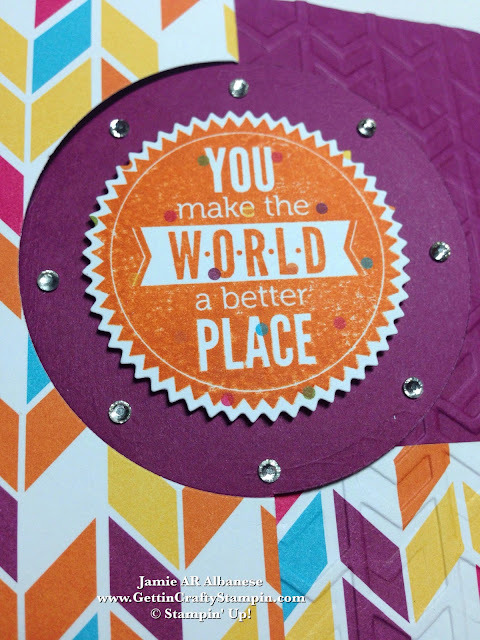 After you are finished with applying the Sweet Taffy Designer Series Paper to the Right Side of the card, then the lower half of the left, open that flap and add texture! Simply use the Arrows Embossing Folder (on the standard platform) and the Big Shot to add a fun, coordinated embossed texture to this card 'flap'. Show that special person how they have added color and sparkle to YOUR Life! (Don't Miss Out on the Sparkle and Shine class coming up this Friday!) 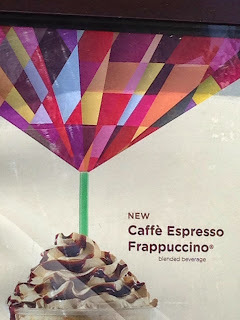 It is a MUST for my Paper Crafting to OWN a Big Shot (I have two and am in bliss). I love creating and delivering unique, moving/interactive cards with texture! This card has it all with the aide of my Big Shot Die-Cutting/Embossing Machine! With the SALE happening here in August, you can SCORE $55 in FREE Big Shot accessories and Discounts on other Bundles! It's a dream come true! 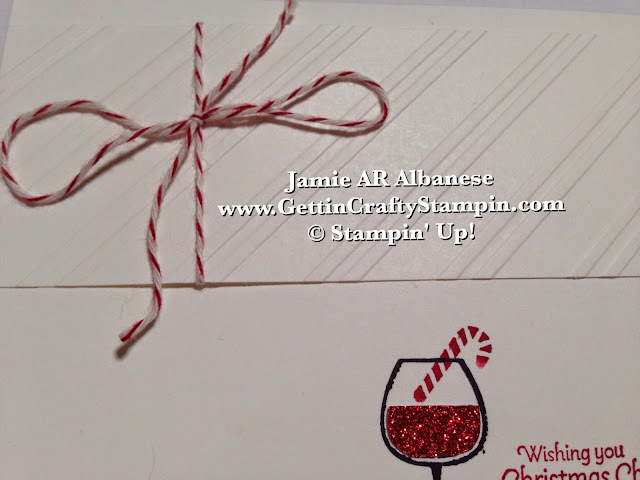 Send a WOW hand-stamped card that was easy and fun to create!